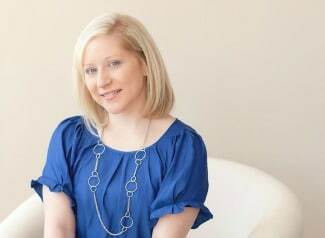 If you will be baptizing your child soon and need some great Baptism Party Ideas, than look no further than this unique inspiration! These 22 Christening and Baptism Party Ideas are sure to make that special day in your family’s life absolutely perfect! From cake ideas to baptism centerpieces, along with party favor inspiration, you will have all of the unique baptism party ideas that you could possibly need! Baptisms and christenings are such a special time in a family’s life. While the little one may not remember this special day and will only be able to look back on the pictures of the event someday, it’s an important rite of passage for many families and their religions. Whether you have a boy or a girl, there are many great Christening and Baptism Party Ideas below! This Cross Photo Display is a great way to showcase your sweet little one with their best pictures for everyone to admire! 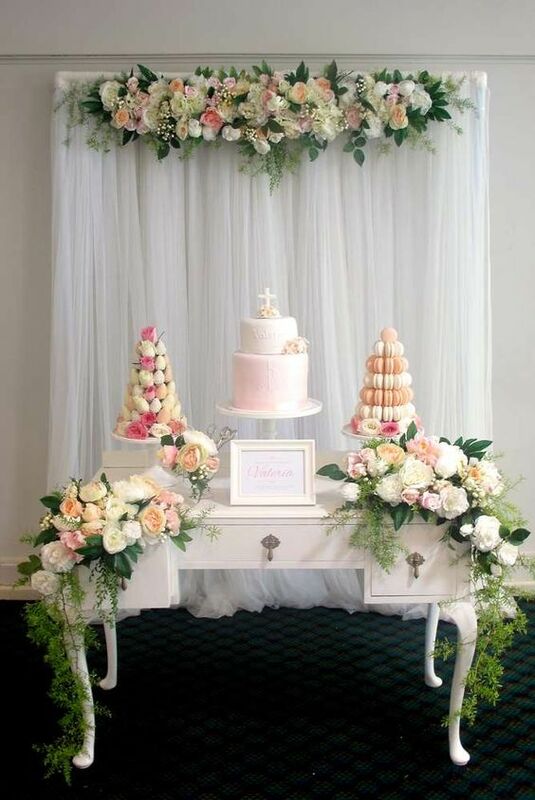 What a great way to set up a backdrop for your dessert table, or as in this picture, the drink station. So cute! This beautiful Baptism Flower Centerpiece Idea is a great DIY project that can be done before your child’s big day! Simply paint mason jars with the color scheme of your baptism celebration and add in flowers and greenery to spruce up every table at the reception! 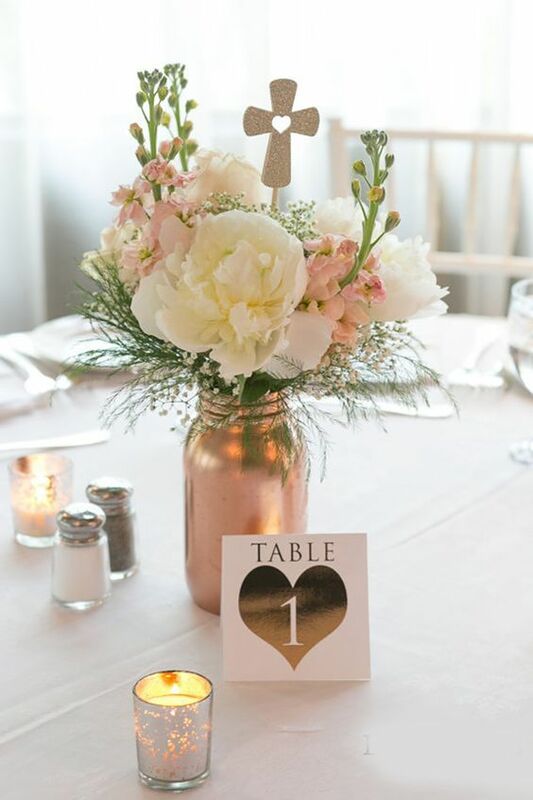 We especially love this rose gold metallic paint that was used for this mason jar centerpiece project. Gorgeous! 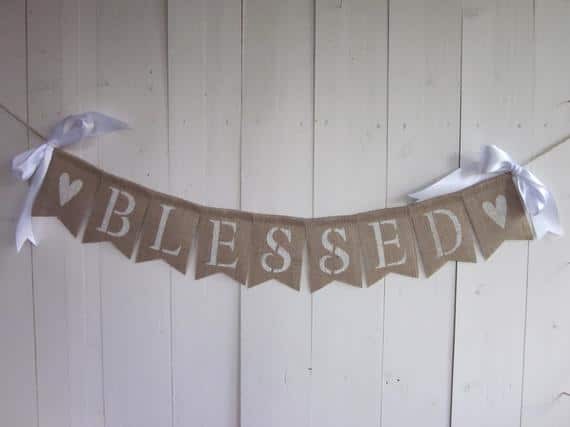 A Blessed Banner is a great addition to any baptism party. This is a great DIY project that you can create to put on the dessert table, or to use as a backdrop at the celebration. Simply use stencils and paint, and create your words, which you can then string up on rope and add ribbons to the sides. Perfection! 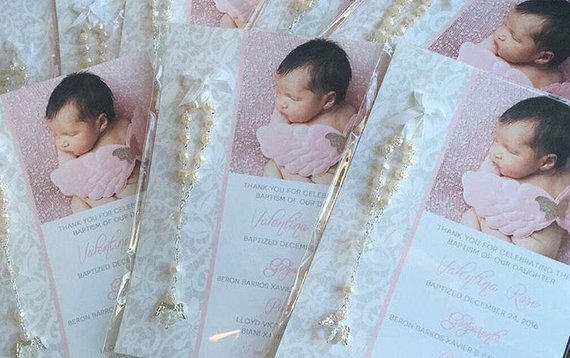 Rosary Party Favors are the perfect baptism party favors for your child’s celebration. 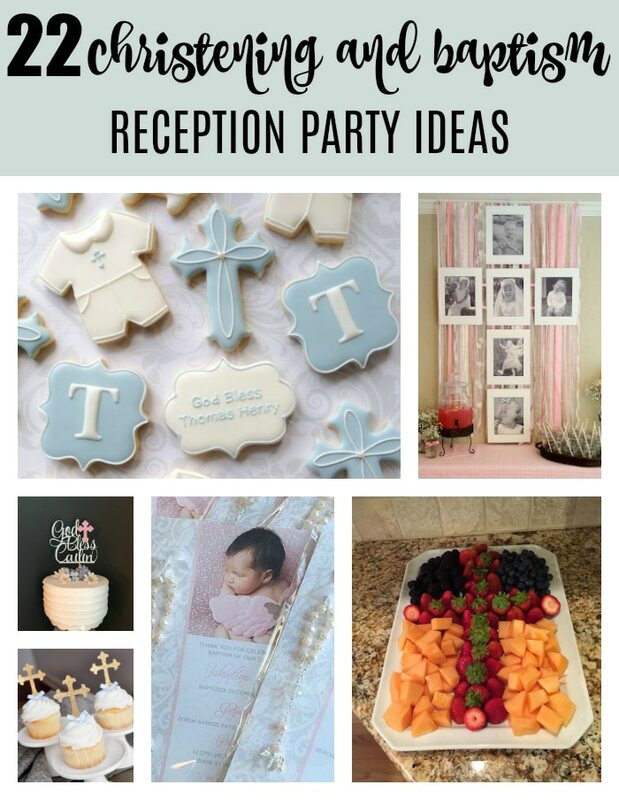 What a great thing to include when you are putting together your Baptism Party Ideas for all of the attendees of your baby’s big celebration! 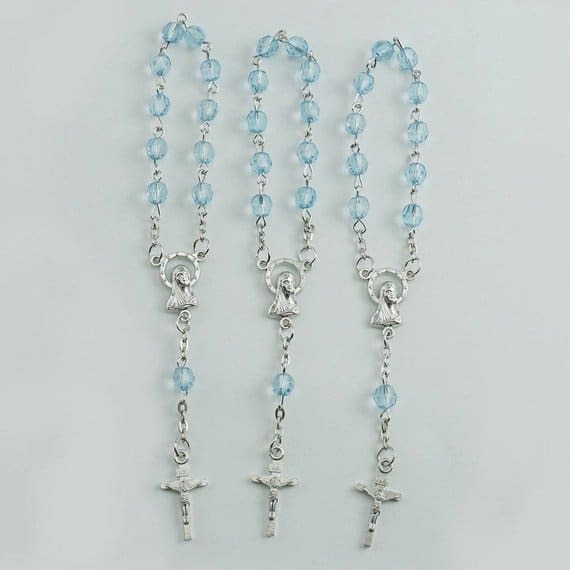 This is another great party favor idea and these gorgeous Angel Rosary Favors make things a little more personalized! We love that it has a cute picture of your little child of God, along with a thank you note for everyone who is able to attend your baby’s christening or baptism. It is also a great baptism idea that can be altered for boys or girls. Perfect! 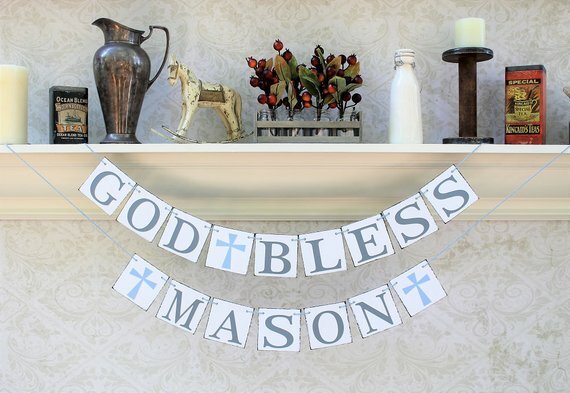 We love cute, personalized baptism decorations like this God Bless Banner! Add in your child’s name, along with pink or blue crosses for baby boys or baby girls and you’re all set! 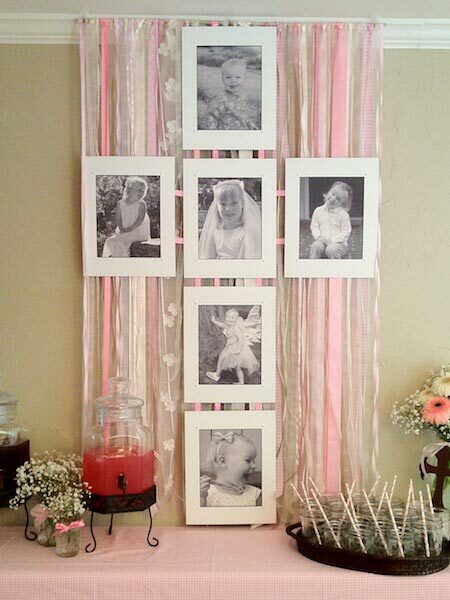 What a simple, yet great Baptism Party Idea that you can put up anywhere at your baptism or christening reception. 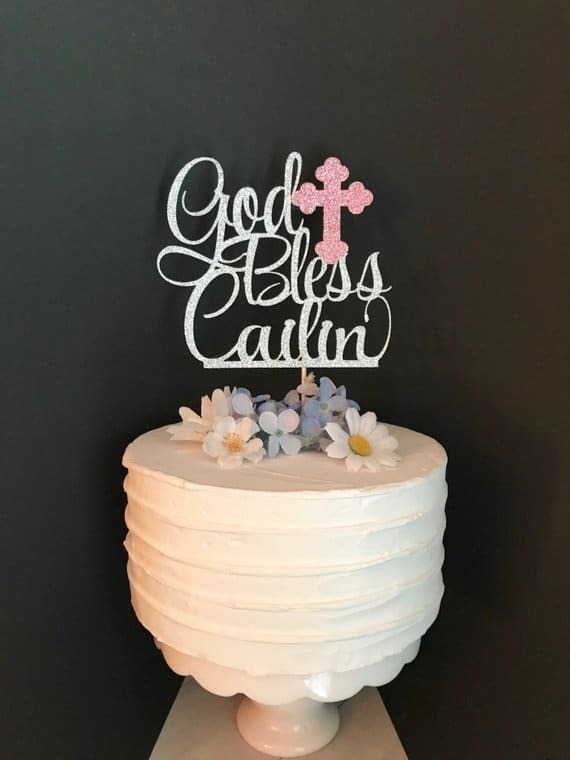 What an amazing God Bless Cake Topper on this baptism cake! We love the simple cake that is completely brought to life with this amazing cake topper decoration. Add in some simple flowers on the top and it is a gorgeous baptism cake for girls or boys! We love this Personalized Baptism Printable that you can create for your little one. 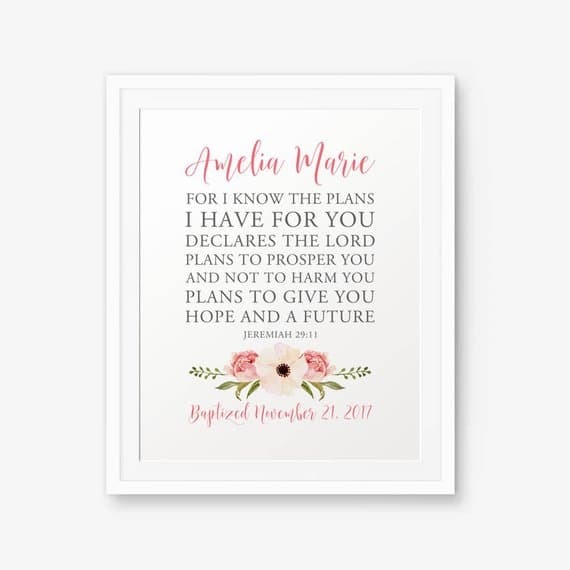 What a wonderful addition to any Baptism party that would be a great placement on an entry table or even on the dessert table. 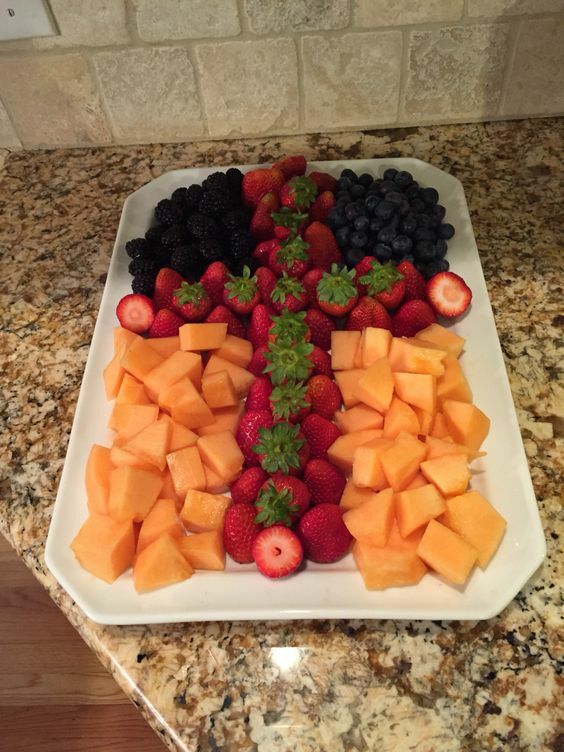 How amazing is this Cross Fruit Display?! This is a great DIY food item that you can create for your child’s baptism party. Feel free to even mix up whatever kind of food you want and create your own cross that suits your loved ones! How amazing are these White Angel Baptism decoration ideas?! What an incredible display for any christening or baptism theme. 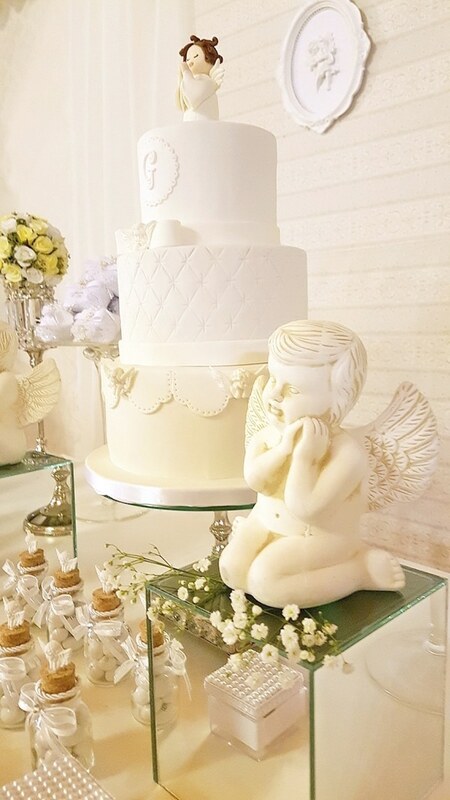 We are in complete awe over the white angel statue that sits next to this pristine white baptism cake. Absolutely stunning! Who doesn’t love some delicious Baptism Cookies to add to your Baptism Party Ideas! 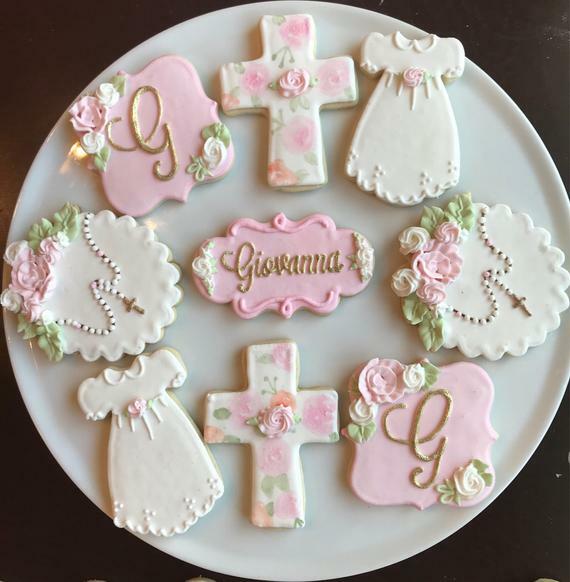 These are absolutely gorgeous and we’re betting you can head over to your local baker with some baptism cookie ideas, or if you’re up to it, even create them yourself! These Rustic Baptism Ideas will have all of your guests oooh’ing and ahhh’ing over your amazing baptism party decorations. We love this naked baptism cake with the gorgeous greenery that is surrounding everything on the main table. This is so gorgeous! 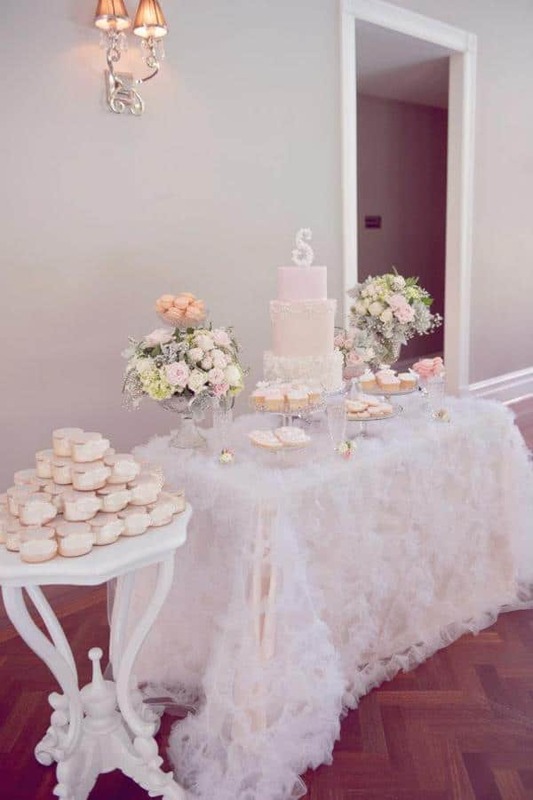 What a bright and Gorgeous Baptism Cake Table for your little one’s big day! We love the colorful displays, along with the greenery that is found on the dessert table. The soft pastels, along with the gorgeous white backdrop make all of the baptism decorations spot on for your little one’s special day. This Vintage Pink Baptism Party is such a great baptism theme for baby girl baptism party ideas! The table cover is absolutely lovely with fun and flowy fabric. We love it! 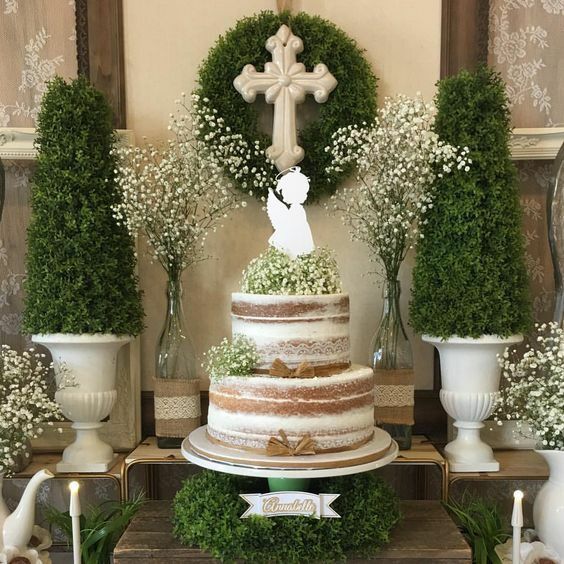 The beautiful baptism cake is the perfect baptism centerpiece for this amazing display. 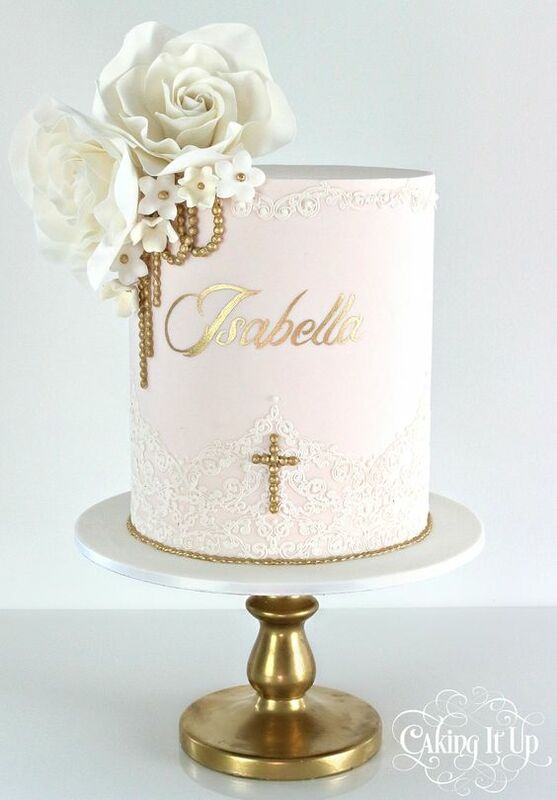 Everything about this Pink and Gold Baptism Cake is dreamy, but it is the amazing decorative flowers on the top of the cake that really make us swoon! What an incredibly gorgeous cake, that absolutely shines with a perfect gold cake stand. It’s breathtaking! 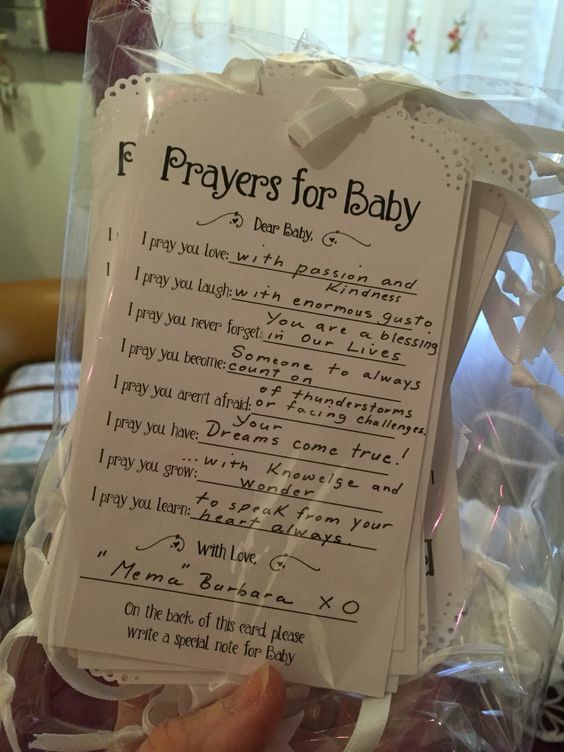 This fun Prayers For Baby Baptism Party Idea is a great way to involve all of your guests for your little one’s special day, as well as have great keepsakes for your child to look back on in the future. Have everyone fill in these cards before they leave and create a special remembrance for you and your child to remember the day now and forever! 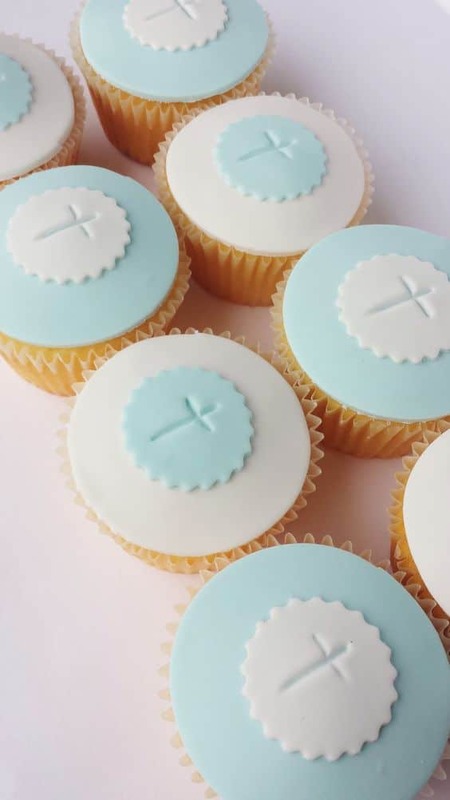 These Cross Cupcakes are a great DIY baptism dessert idea that you can create in no time! We love them because you can also change up the color to match whatever kind of baptism theme you have created. Perfect! 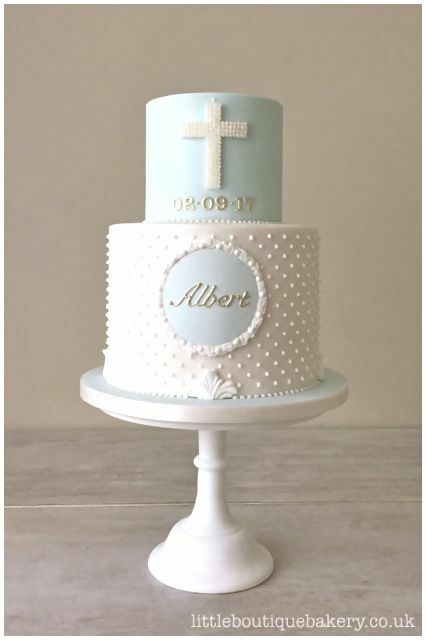 This great Boy Christening Cake is a must on anyone’s baby boy baptism party ideas list! What a gorgeous addition to any baptism party. How sweet are these Boy Christening Cookies for your christening or baptism party? 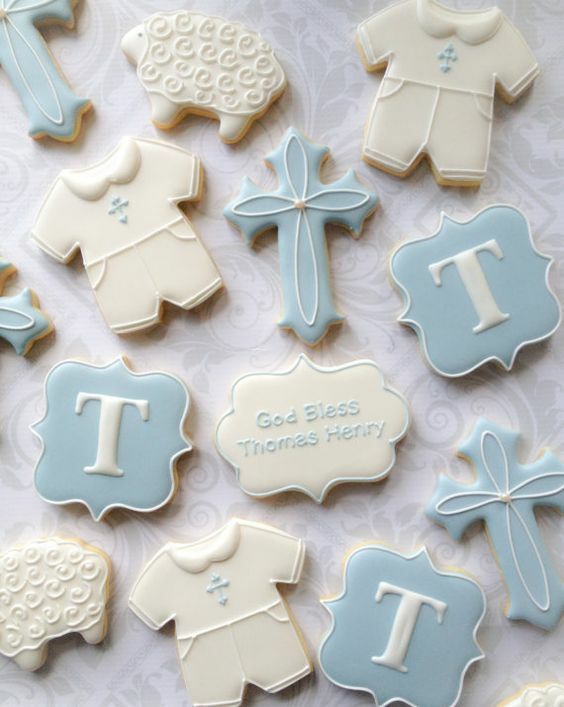 We love how they are personalized with the little one’s initial on some of the cookies, along with a fun boy baptism outfit that everyone will love. 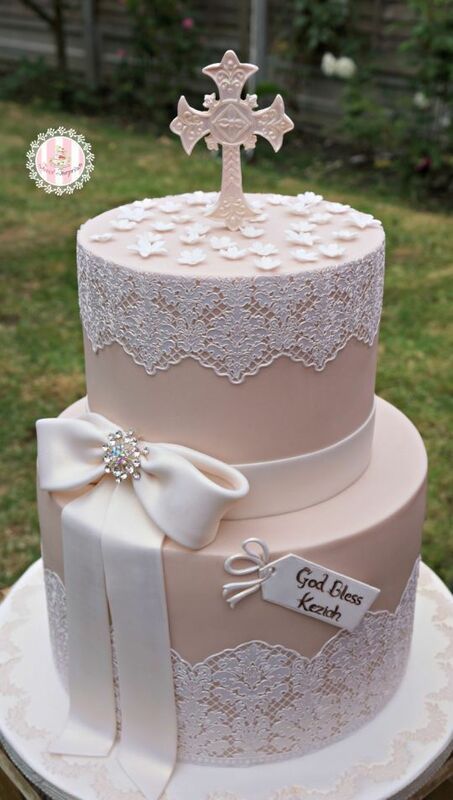 This Girl Christening Cake is absolutely stunning with the intricate lace details that are found on the different layers. That is an incredible fondant bow along the side, as well. We love it! 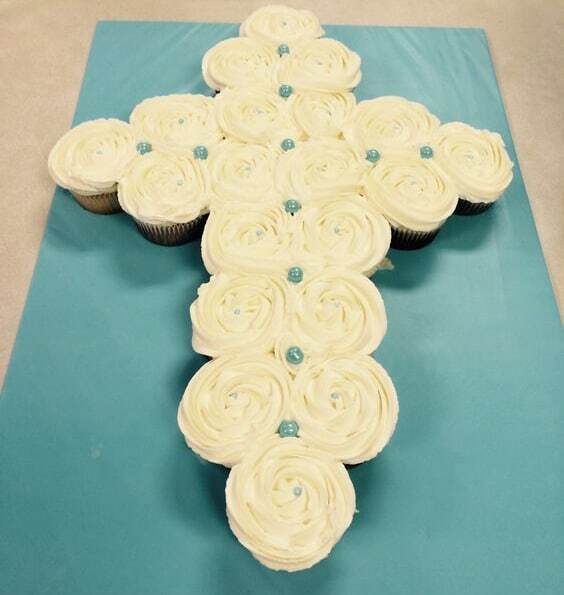 A Cross Cupcake Cake is a great way to create a DIY dessert that you can tackle to serve at your child’s baptism party. Simple and elegant, yet a great dessert! 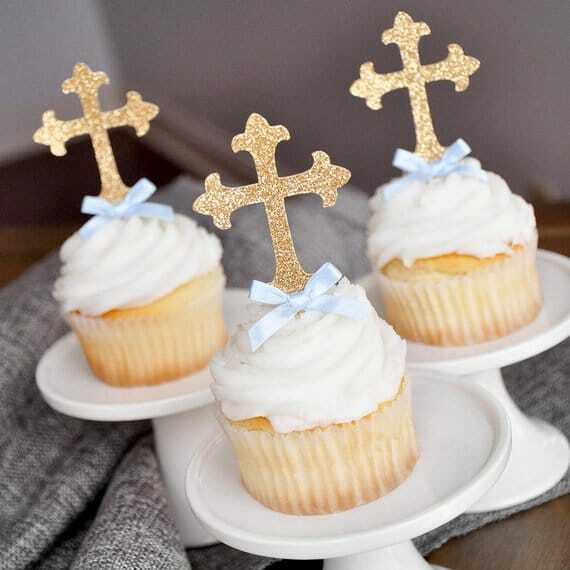 These Gold Cross Cupcake Toppers are absolutely beautiful and take all of the guesswork out of how to decorate your baptism cupcakes! We just love them! What are your favorite baptism and christening party ideas here? Let us know in the comments below! For more party ideas, follow us on Instagram @prettymyparty and Pinterest and join us in our private Facebook group.